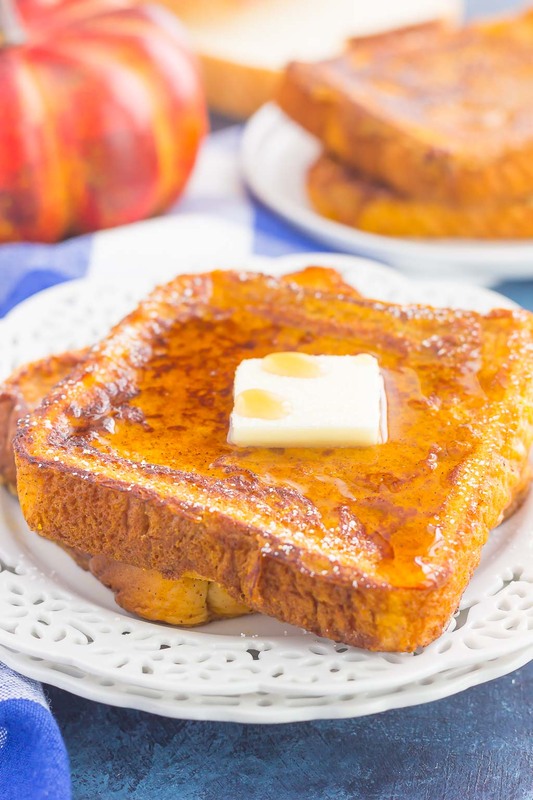 This Pumpkin Spice French Toast is the best breakfast to enjoy on those chilly fall mornings. Crispy on the outside and tender on the inside, this easy dish is bursting with flavor and perfect for the whole family to enjoy! I think I waited long enough to break out the pumpkin…don’t you think? After all, it is officially fall, so I don’t feel quite so bad about shoving all of the apple and pumpkin recipes in your face. 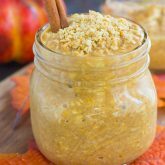 And I’m sharing one of my favorite fall breakfasts with you today! Since I work way ahead on my editorial calendar and blogging content, I was already testing pumpkin recipes back in June. And this Pumpkin Spice French Toast was a winner right from the start! I almost shared it with you in the summer, but I’m not that crazy! Even though the weather isn’t cooling off here yet (it’s been in the 90’s this week! ), I knew it was time to whip out everything pumpkin, and then some. And since I’ve made Pumpkin Spice Waffles, Pumpkin Pie Baked Oatmeal, Pumpkin French Toast Cups, and Pumpkin Pie Overnight Oats, it was time to add a classic french toast to the collection. 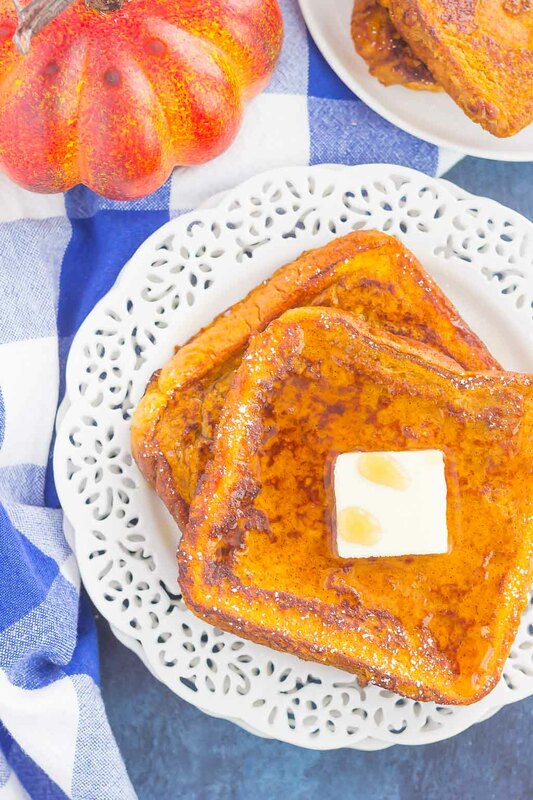 If you’ve never had Pumpkin Spice French Toast before, then you’re definitely missing out. It’s full of pumpkin-y flavor, so easy to make, and perfect for fall. And the ingredients are simple. In fact, you probably have everything you need to make this dish in your kitchen. I like to use a thick bread for the toast, such as Texas toast or challah, as it holds up the egg mixture better than regular bread. 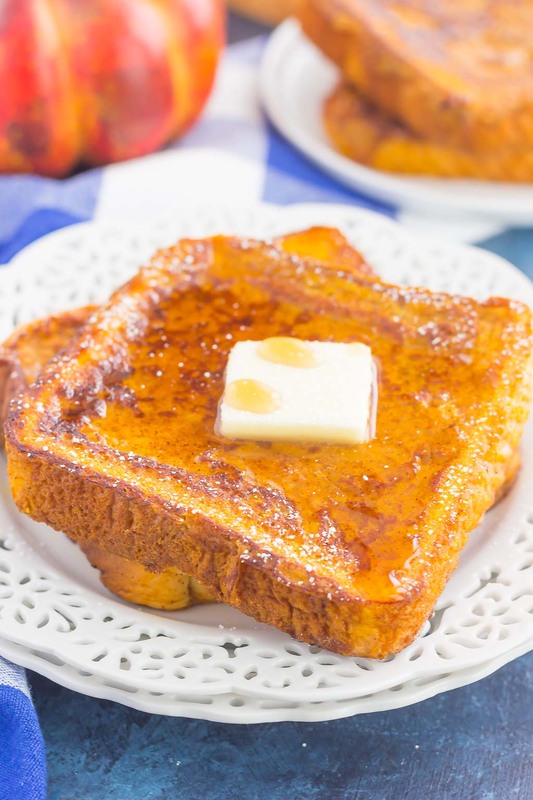 From start to finish, you can have this dreamy, crispy yet tender, Pumpkin Spice French Toast ready in about 20 minutes. Sounds pretty darn good, right? 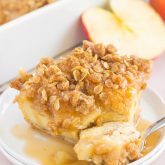 Perfect to serve with a dusting of powdered sugar, some butter, and a good drizzle of maple syrup, you’ll be whipping up this breakfast all year long! Preheat electric griddle or non-stick skillet over medium heat. Set aside. In a large bowl, whisk eggs, milk, pumpkin, light brown sugar, vanilla extract, pumpkin pie spice, and cinnamon. Pour into a shallow baking dish to dip the bread, if needed. Dip bread into egg mixture and lightly press down to coat both sides. Melt butter in skillet. Transfer bread to skillet and cook on each side for 3-4 minutes, or until golden brown. Repeat with rest of bread slices. Serve immediately with powdered sugar, butter, and/or maple syrup, if desired. 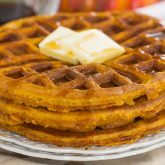 If you had have shared this recipe in June, I would totally be a-ok with ;) Love fall, love pumpkin season and this recipe sounds and looks amazing! So perfect for a lazy Saturday brunch with lots of maple syrup and coffee. Can't wait to try this one out. I just opened some pumpkin this weekend so have leftovers and now I know what I can do with it :) Pinned! Have an awesome week, my friend! 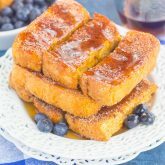 Maple syrup and coffee is perfect with this french toast! Thanks for the sweet comment and pin, friend! Okay, so you know how I've say (for years) I don't like pumpkin? I think my taste buds have changed! And I think I like pumpkin!!! Crazy right?! I'm so excited because I always felt so left out when everyone was raving about pumpkin this and pumpkin that. I still won't buy an overpriced PSL, BUT I am TOTALLY on board with this french toast!!! It looks absolutely delicious, Gayle!!! I definitely MUST TRY for sure! Pinned! Cheers, dear! Haha that is crazy but glad you like pumpkin now! Thanks, Cheyanne! I don't make french toast enough and every time I do I think I need to make it more often! I love this version with the pumpkin and warm spices. I would love this with challah bread! Thanks for the french toast love, Marcie! I have to tell you...I love my pancakes - but I LOVE my French toast! We had pumpkin spice pancakes this weekend, and it was very good - but this French toast is happening! Thanks for the inspiration!! Pinned! Thank you, Annie! I do love pumpkin spice pancakes too...perfect for fall! perfect breakfast for fall, I want to dive right in! Love it, perfect for fall! But honestly, I can eat this french toast year round! Pinning! 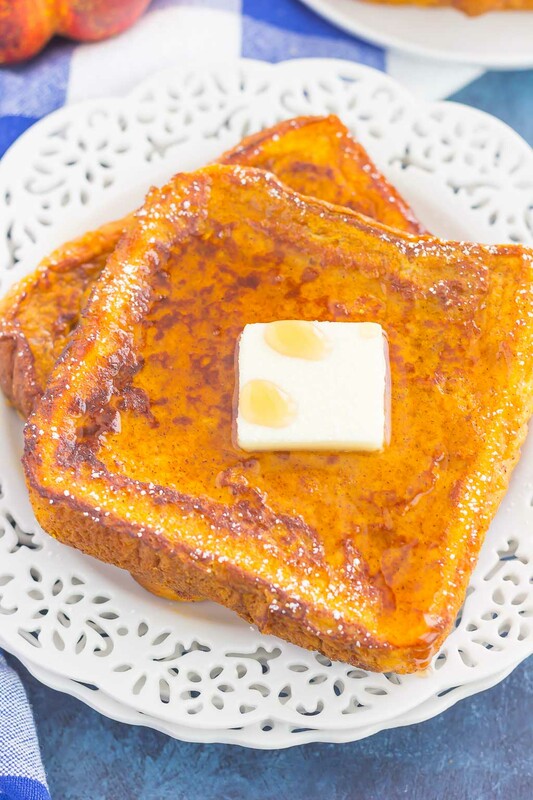 This pumpkin french toast looks delicious, Gayle! What a perfect fall breakfast or brunch! I'm loving that it's still so hot out and summer is hanging around.... but I have to admit, I am a teensy bit excited for the fall weather to arrive. Have a great week! I'm the same as you...I am loving the summer weather, but am ready for it to cool off just a bit! :) Thanks for the french toast love, Keri! Who doesn't love French toast? But add in pumpkin?? Heck Yes!! Pinning!! Thanks for the kind words and for stopping by, Kim! Why is tomorrow only Tuesday?? This is all I want in life!! Yep, yep, 1000x yep. I hope this is what my Saturday will look like every weekend for the next 2 months or so. Love this recipe! It's been too long since I've made french toast! This is going on our weekend brunch menu! Hope you love it, Jessica! This looks like such a comforting and delicious breakfast. I absolutely love it. Definitely trying this out this weekend!!! Thanks for the kind words and for stopping by, Ashika! Hope you love this french toast! The weather here has been so warm too - but it's supposed to cool down this weekend and I am PUMPED!!! Yay for fall! I haven't had french toast in forever ... this look delicious! I should not be browsing recipes while I'm hungry. This looks SO good, I want it for lunch!